The mantra of creative writing, “show, don’t tell,” is sound advice. Readers of fiction often become bored when told all the thoughts, feelings and motivations of characters. They may even feel insulted that the writer thinks they’re too dim-witted to figure out that Marcie is jealous or that Nancy is hurt. So writers are told to show this through the character’s actions, words and demeanor. But when it comes to non-fiction and particularly in the personal essay or memoir, everything changes. For nonfiction writers there’s much more than just showing. Phillip Lopate, who literally, wrote the book on the personal essay, offers pointed advice in his newest manuscript: To Show and To Tell (2013, Simon and Schuster). He’s saying that writers of nonfiction first need to show by dramatizing events. But it doesn’t end there; he stresses the importance of stopping and thinking about what the events of the essay mean. Without reflection, with only showing, it’s like writing with one hand behind your back. There’s a need for what he calls “writerly curiosity.” For example, through the essays of Emerson and Montaigne we see writers grappling from sentence to sentence, trying to make sense of issues and being surprised with the results. Lopate says this “curiosity is endlessly generative and regenerative.” Lots of reading in this genre will help writers explore how nonfiction theory works in practice. His classic volume, The Art of the Personal Essay (1995, Random House) can seem overwhelming with its 774 pages; but the book’s introduction is a mini-seminar in the form and it’s given me the go-ahead to include my deepest thoughts and observations into my work. So, it’s okay to be unsure of how I feel about the family secrets that gnaw at me. It’s acceptable to be uncertain at the beginning just how the piece will turn out or which side I’ll take. Once I got past all my childhood ordeals, I found I could use this curiosity to write the rest of the story. And maybe that turned out to be the best part. Now, I find I have much more to say in my already extensive writing about my rocky father/daughter relationship. The conflicts hashed and rehashed in my early writing have been expanded into thoughtful revelations. Our debates/arguments about the state of the world have helped develop my critical thinking skills. I learned early to defend my opinion and not be easily shut down. His insistence and determination have instilled values in organization and saving. It turns out Dad’s strict adherence to his rules has taught me some valuable life lessons and incorporating his values into my own life has paid off well. And as a writer, being open to the uncertainty of what I think, feel and understand has added to the depth of my writing. What a relief to know that it’s quite okay to not know anything for sure and to work that out on the page. My first adventure into the world of work began when I was twelve years old and started baby-sitting. It was a great way to earn spending money and after the kids were in bed I had plenty of free time to read and watch TV. This seemed like a dream job, until I got a little older. In my senior year, my needs changed (read: boys) and on weekends, I wanted to go out with my friends. My parents thought I was too young and my policeman Dad, overly protective in my mind, had no understanding of how that cop car in the driveway was impacting my social life. After much whining and begging on my part, they finally pronounced that I could go out if I didn’t have a babysitting job on Saturday night. This worked for a while but soon I felt trapped. Often, at the last minute, someone would call for a baby sitter and I’d have to drop my plans. There was actually one time when my friend’s car was idling in the driveway, my hand was on the door knob, then the phone rang and I was out of luck. On most Saturday’s I’d be a wreck all day. Each time the phone rang, my world would stop. Please, please, please don’t let it be a babysitting job. I’ve made it the whole week with no call. I have plans. Really important plans. Please, please, please. I tried to convince my parents that backing out at the last minute could lead to my friends no longer including me? I was frantic! But Mom and Dad, the long revered united front, were adamant. Those were the rules. Finally, I had to do something; the whole world was passing me by! So occasionally, I started saying I had a babysitting job when I didn’t. This phantom commitment was always for the Pickering’s or the Taylor’s who were just a short walk around the corner. Friends, and especially boys, loved being part of the conspiracy of picking me up down the block. I was amazed how easy this was and that Mom and Dad never asked questions. I guess they were just happy I was making less of a fuss. And I was careful not to do it too often so they wouldn’t get suspicious. But my life of crime was in for a jolt. One night, after I was already out with friends, Mrs. Erickson, who I’d said I was sitting for, called. She explained that something had come up at the very last minute; she was sorry to be calling so late and would certainly understand if I was already booked. Dad took the call and, I found out later from my sister, his investigative skills quickly kicked in as he realized what was going on. He grilled my sister, who, of course, knew everything. The group of boys from Milwaukee who visited one of their family’s cottages out on the lake. The exciting new romance my friend, Ellen, was enjoying. The beer keg in the living room. Looking back I see a parent’s concern but at the time, the freedom and excitement was alluring. Ratted out by my own sister. Darn! Once he had the whole story, he was in hot pursuit. For many years, Dad proudly told how he walked right up to the front door, knocked and asked for me to come outside. He informed me I should get my coat and follow him. I was going home! Though not in his police uniform, my memory is vivid of the aura of power and authority he displayed that night and every other time I’d challenge the status quo. And there were many. It was a very quiet drive home, but this ordeal wasn’t over. Once in the kitchen we all stood around being uncomfortable. Mom, off in the corner, wringing her hands and my sister smirking in enjoyment that I’d finally been caught. Dad rummaged around in the kitchen junk drawer until he found the ruler he’d long ago used for discipline. He put it in my hand. “Here, take this,” he said in a calm and quiet voice. “Go ahead,” he continued as he turned away from me, bent over a little and pointed to his backside. He seemed ready to maintain this freeze-tag pose until I delivered the punishment he was certain he deserved. Or was he pulling some reverse psychology? Either way, I wasn’t buying it. I put the ruler down on the counter, went up to my room and pouted. A few days later, after things had calmed down, I decided to once again plead my case. I went to Mom first as I was accustomed to doing. She sympathetically listened but then ended with her usual answer. By the time I got the courage to approach Dad, I think they’d talked to each other and to some of their friends who’d had similar problems. Or maybe Mom’s persuasive skills were better than I thought. Either way, they seemed to have a new understanding of what was at stake. Much to my relief, our conversation wasn’t the usual interrogation, instead more calm and reasonable. From then on, I was allowed to go out on Saturday nights, no matter what. This was a huge win and just the first in a series of compromises my parents had to make for me, the oldest of their six kids. Much later, while home on a visit from college, I could tell things had changed. The rules had loosened up considerably, judging from the freedom and autonomy my three youngest siblings were enjoying. I had to fill them in and we sat down for a talk. I loved telling them my stories of how things used to be. And I made sure they realized how much they were benefitting from my early bravado. And just how much they owed me. But I most enjoyed boasting that now there was no way Dad could interfere with the delayed adolescence I was finally enjoying at college. (March, 2015) It was one innocent conversation that changed my thinking. Talking with my friend, Betty, who would reach the same birthday milestone as me later this year, we commiserated about turning seventy. Moving from one decade to the next seemed ominous. Then, she wisely reminded me how lucky we are. Relatively active. Moderately healthy. Retired and enjoying it. Just think of all the people we know who didn’t make it this far, she said. And oh, was she right. From there I decided to meet life’s inevitability with a smile. I’m going to have a birthday party, I told her. Childhood memories resurfaced of how in my family, we got to have a birthday party only once, when we turned twelve. Sure, we got a cake and ice cream at dinner with our family each year, but the big thing was when we turned twelve. Then it was a real party, inviting friends, complete with hats and games. With so little attention paid to these days when I was a kid, many adult birthdays passed with little notice. Time for a change. 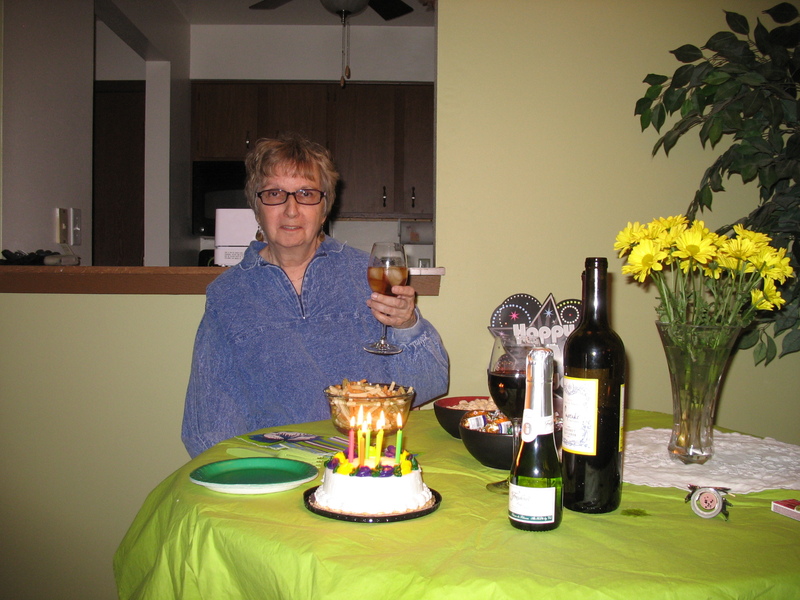 I recalled my friend, Carolyn who each year celebrated a birthday week. Each day of that week, her husband knew he was expected to plan something sweet. Not anything big, just something to mark the occasion. Carolyn was my inspiration and planning seemed to take on a life of its own. I realized I had several groups of friends who didn’t know each other so it made sense to plan something with each of them. Soon, I had scheduled four events. Before I knew it, I was having a birthday month. I sure never thought I’d out-celebrate Carolyn! T he group of women I went to Door County with since the late 1980’s had a long history of game playing and porch sitting traditions I wanted to replicate. 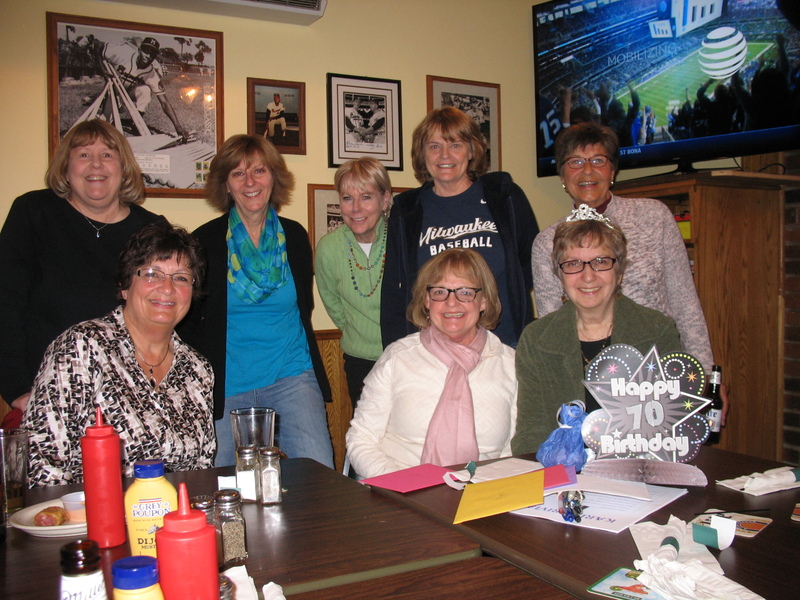 On Saturday March 7th eight of us (me, Betty, Patty P, Pat H, Kathy, little Patti H, Diane, and Sandy), (Bonnie, Trish and Ginny wanted to be there but couldn’t) met at McGinn’s in their side room surrounded by pictures of Robin Yount and old County Stadium. Some got glassy eyed, recalling spring training adventures of the past and opening day parties. Diane Marie (our “new best friend” sitting at a nearby table), took our group picture. When our Diane revealed that she was also a “Diane Marie,” major bonding ensued. 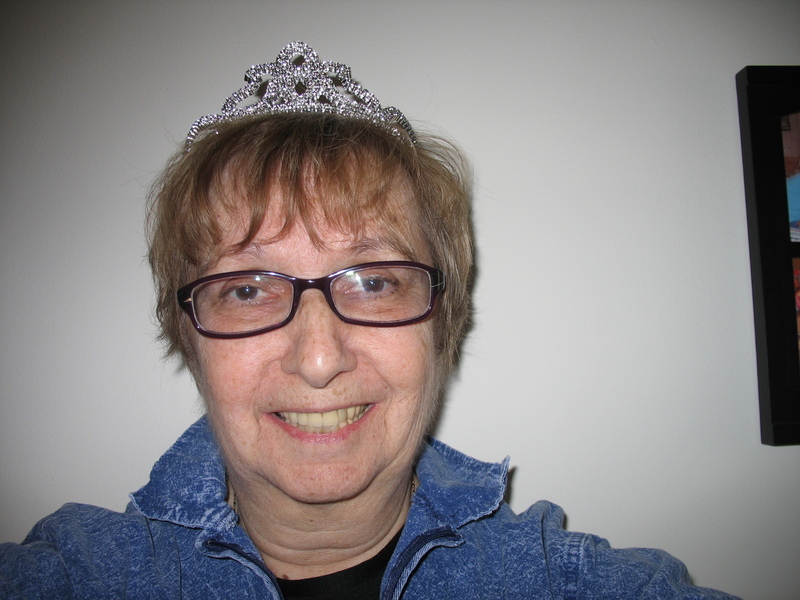 When new friend Diane Marie declared that I didn’t look 70, I tipped the traveling tiara toward her and wore it proudly all day! “Karin Trivia” was played with gusto. My trivia questions were pretty basic with ten queries about my family, school history and special interests. No one remembered how I and all first time attendees at Betty’s annual Christmas party had to mime the Twelve Days of Christmas. Or the part I played in the maids-a-milking debacle. We laughed a big one. Little Patti H and our Diane Marie tied “Karin Trivia” with a score of five. The two light-up chicks, the prize, was awarded jointly to them and then deemed great toys for little Patti H’s granddaughters. 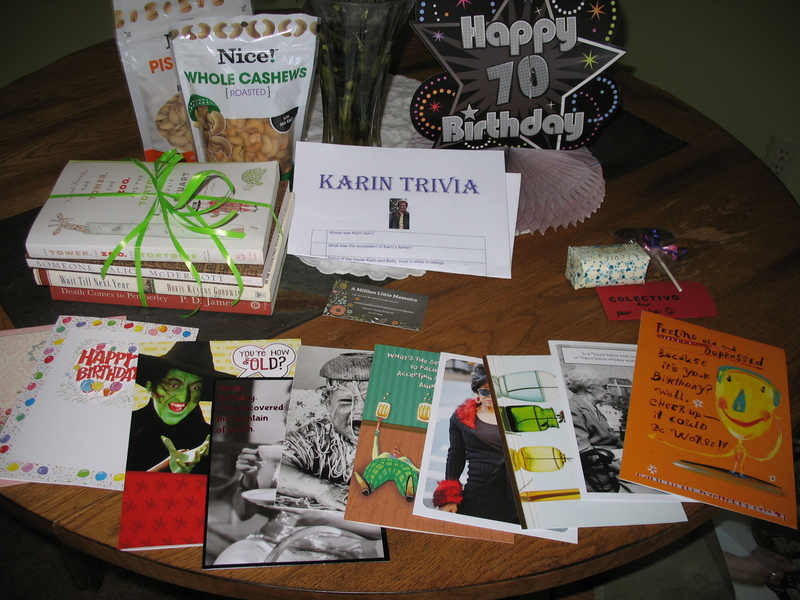 I loved all the cards, Betty for the nuts (no need to steal cashews now), little Patti H for the “few little things,” Trish for the books, (now we know that reading is my second favorite hobby). 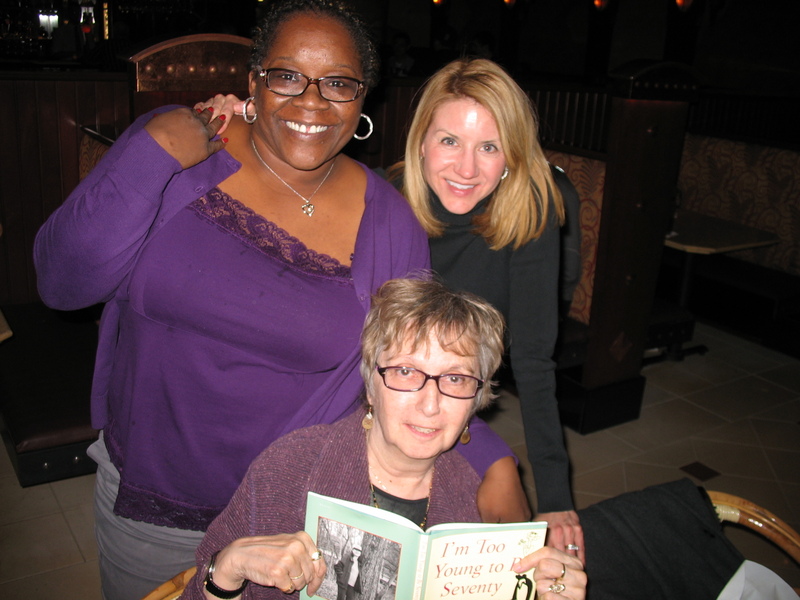 On March 18th, the Plain and Simple Book Group met at my apartment. I’d belonged to this group for ten years before moving to Eagle River and when I returned to town, they found me and made me feel welcome once again. 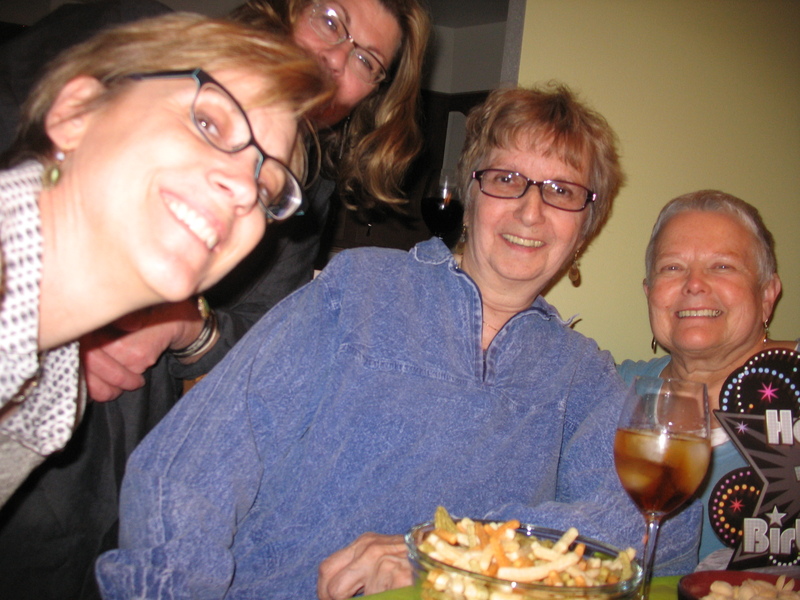 That night, it was a small group (me, Jane, Susan and Mary Beth) due to several others being off on spring break, out-of-town adventures. For this regular monthly meeting, I’d gotten a small cake and candles, wine and snacks. In one hearty puff, I blew out the candles (7, one for each decade). It seemed so fitting that the book under discussion was The Alchemist. The meaning of life’s journey was fully examined. On March 26th, three of the four stankin’ ho’s (Julie, Stephanie and me, Chris was recuperating) met at the Cheesecake Factory. Though we haven’t worked together for over fifteen years and our age spread makes Julie and Stephanie young enough to be my daughters, we can laugh and talk for hours. Which we did, of course! Julie’s card included a hand-written John Lennon quote (“You and I have memories longer than the road that stretches out ahead.” ); it almost made me cry. When our handsome, young waiter, Derrick, took our picture he insisted I couldn’t possibly be seventy. In fact, he thought I was fifty! Needless to say, he got a very big tip! 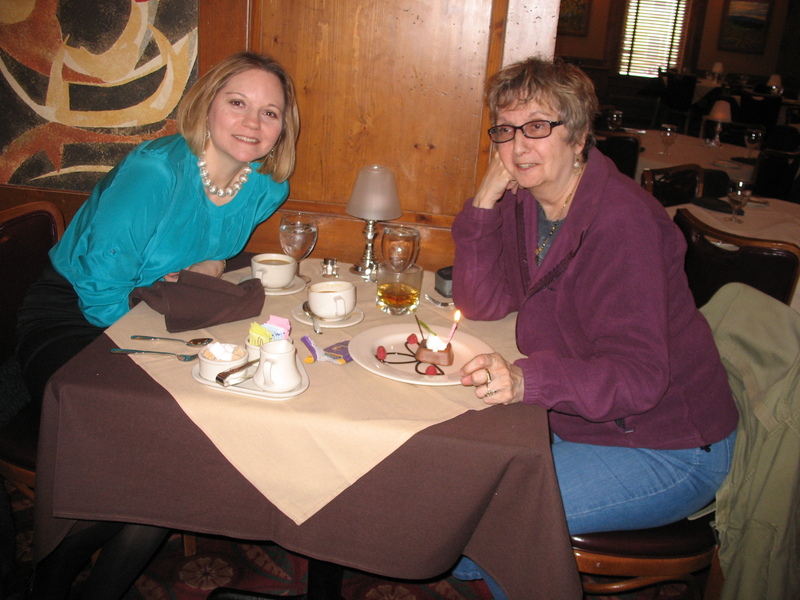 On March 30th, I ended the month with a cocktail lunch with my niece, Jujee, at Eddie Martini’s. By far, the classiest place, the waitress overheard it was my birthday and delivered a chocolate treat complete with candle. My lunchtime Manhattan was especially flavorful. Great atmosphere, great food. Great conversation, as always. And so the month ended with wishes fulfilled and parties that will be a fond memory forever. I’m so lucky to have such wonderful friends who shared this time with me. And perhaps I’m getting wiser in my old age. Oops, that’s not what I meant to say! Let me try again. Perhaps I’m getting wiser as I learn to have more fun in this next phase of my life. Not wanting to be mushy, I have to wonder if I’ll make it to the next decade. 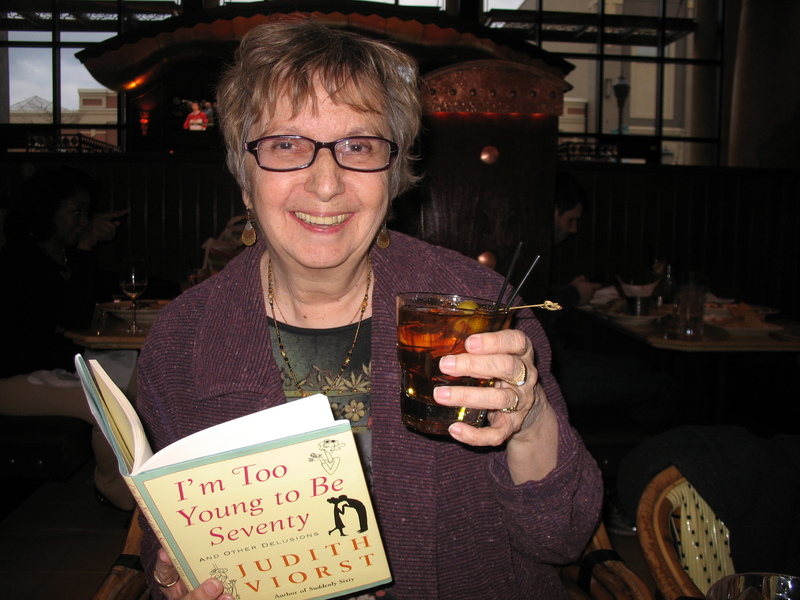 If not, I can at least say that I had a blast marching into my seventies. Happy birthday to me!